In India, monsoon is the most important of all the seasons. It is the lifeline of the country's agrarian economy and, also the giver of its year-long supply of drinking water. No wonder then that every Indian waits for the the monsoon with an eager heart. But when it comes to women of India, monsoon means much more than economic gain. For millions of Indian women, monsoon is the season of freedom. In an otherwise orthodox society, where a woman lives with a number of taboos, Monsoon brings in her life a day when she can break free and have fun, without being judged. Here are a few glimpses of that freedom. After Ashadh, comes Shravan. 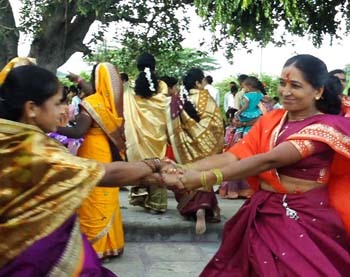 Married women all across northern India celebrate TEEJ, the most well publicized of all the monsoon festivals in India. Dressed in their bridal finery, the women sing, dance and swing. 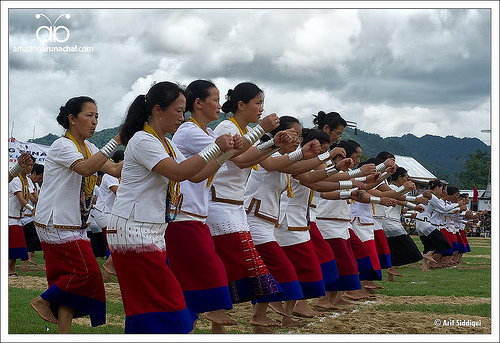 Though they observe a day-long fast, this is a celebration of womanhood and life. In the eastern Indian state of Odisha, women - both young and old, married and unmarried, celebrate Rajjo - the fertility festival. For three days, they wear new clothes, adorn themselves with flowers and make designs of henna paste on their palms. The most joyous part of it is the swing which otherwise is a complete no no for grown up women. 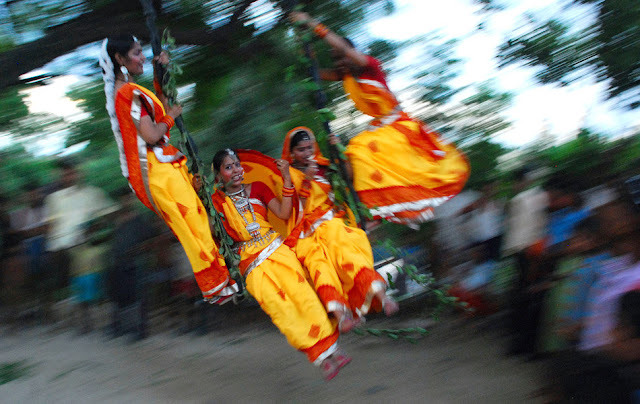 In fact it is almost scandalous of a woman to be riding on a swing in times outside this festival. But the festival is her freedom phase when she doesn't have to feel shy or apologize for enjoying what she loves! 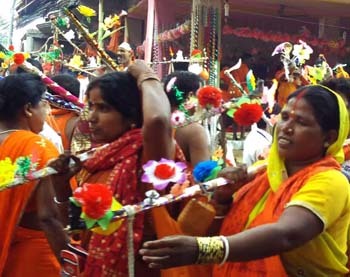 Sharavani Mela: Also celebrated by women in several states of eastern India are a number of 'Shravani mela' or Monsoon fair. In Jharkhand - a state with a majority of tribal population and a troubled political scenario, it is the monsoon when women can participate in the monsoon fair alongside men (but without being chaperoned/escorted by them). 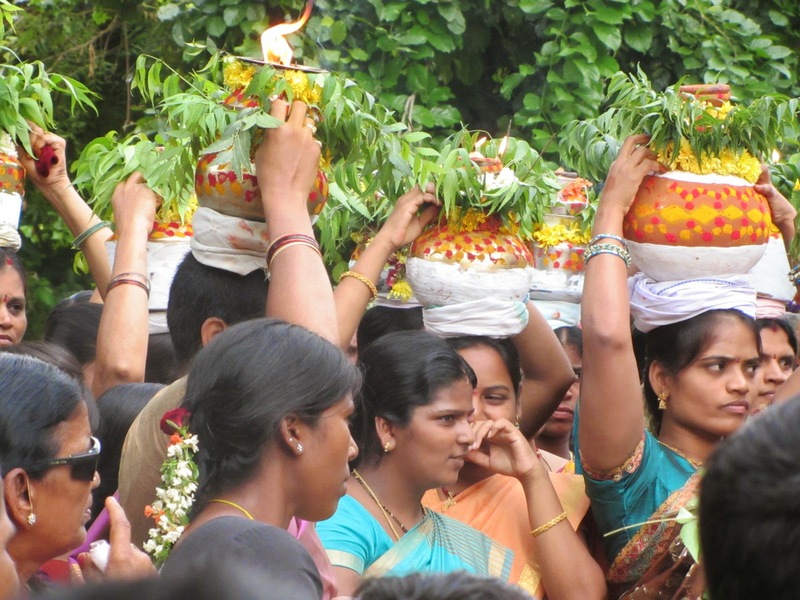 They carry little earthen pots of water on a bamboo staff and offer them to the temples of Shiva. In the all women's groups, the march to the temple is filled with a lot of singing and laughter. During the monsoon, in the western Indian states of Maharashtra and Goa, women celebrate Naag Panchmi - the festival of snake god. Despite a religious theme, the day is a true celebration of a women's freedom of movement. Its the only day in the whole year that they can sing loudly, dance, play games and joke - all of which are forbidden acts in the orthodox society that they live in. Thank you for sharing the pictures and words of this post. 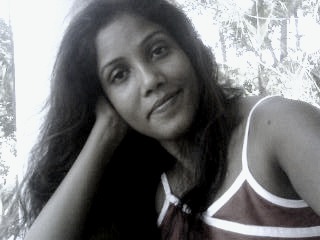 I see the graciousness of life. Thanks very much Phil! I do hope to post more in coming days!